Susan Murray Carlock says her Indiana company is providing something popular opinion has deemed nearly extinct: well-paying manufacturing jobs. Over the past four years, Mursix Corp., a creator of seat belt buckles and bed frames, has sought to fill a variety of production positions. The average wages exceed $20 an hour — a ladder to the middle class. Trouble is, she can’t find workers. The company needs skilled laborers, men and women who can absorb the “tribal knowledge” of the toolmakers before they retire, she said. This year, in an effort to draw talent, the firm set up an apprenticeship, paying promising employees as they learn the trade. Carlock’s predicament isn’t isolated, even in the Rust Belt, where steadily vanishing manufacturing jobs became central to this year’s presidential election. She knows of at least two other plants in Muncie, Ind., a college town in the state’s northeast quadrant, that face a similar hiring challenge. But American manufacturing is changing, and the enterprises flourishing today often demand a different set of skills than assembly lines of the past. One reason for the labor shortage is the fear of change, said Michael Hicks, a business professor at Ball State University in Muncie, Carlock’s city. Many of the open roles involve computer assistance, which requires job training. Although some companies and state programs will cover the tuition bills, some workers, particularly those who’ve held the same job for decades, are hesitant to take them up on the offer, even if unemployment is imminent and the wages are competitive. The average hourly wage for these roles is approximately $20, according to federal data. Young people aren't helping fill the slots either, he noted. They don’t flock to mid-sized cities like they do to, say, Chicago. The share of employees older than 45 in the skilled trades, for example, is about 25 percent larger than for the broader workforce. Drug use, on the rise in rural counties, also disqualifies a chunk of prospective hires, Hicks said. A talent demand exists, in some form, across the country, according to a report released Wednesday by the Manhattan Institute, a right-leaning think tank focused on economic growth. Eighty-eight percent of American manufacturers said they have difficulty finding workers, noted author Mark Mills, once a factory machinist and now a senior fellow at the Manhattan Institute. “There are an estimated half-million more ‘skilled trades’ jobs (i.e., for non-college-educated workers) available than people trained to fill them,” according to the report. President Obama touted that growth in a speech in June. His assertion was true, but it lacks an important caveat. Although the country added thousands of manufacturing jobs since 2010, the numbers haven't come close to returning to pre-recession levels, as Politifact pointed out, a consequence of both trade and technology. There were about 17 million manufacturing jobs in 2000, and that number today sits closer to 12 million, according to employment data from the Bureau of Labor Statistics. The shrinkage accelerated in the years after the North American Free Trade Agreement took effect, enabling companies to tap cheap labor overseas and bringing down the prices of consumer goods. President-elect Donald Trump frequently alluded to the lost work on the campaign trail. One place preparing to adapt to a flurry of jobs shuttled south of the border is Huntington, Ind., about 100 miles northeast of the state capital. United Technologies Electronic Controls, the city’s largest employer, plans to move about 700 jobs to Mexico next year, displacing local workers. Rick Farrant, spokesman for Northeast Indiana Works, a nonprofit workforce development organization, said the layoffs will be disruptive and painful. But he’s confident everyone who loses their job can find another one at comparable pay. 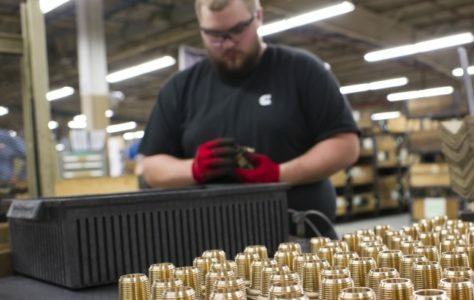 The region boasts more than 10,000 car part manufacturing jobs, for example, and that subsector is expected to grow 8 percent in the next decade, an analysis of Economic Modeling Specialists International data found. The plastic parts subsector, which employs more than 5,000 workers, is projected to grow 7 percent. The vehicle manufacturing subsector, home to 4,246 workers, is on track to grow 22 percent.